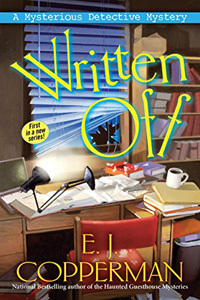 Written Off by E. J. Copperman: Synopsis and Online Purchase Options. Synopsis (from the publisher): Rachel Goldman writes mysteries in which Duffy Madison, consultant to the county prosecutor's office, helps find missing persons. Rachel is busy finishing up her next book, when a man calls out of the blue asking for help in a missing persons case. The caller's name? Duffy Madison.